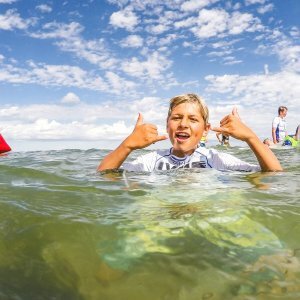 The Windsurfing Kids Camp with Vincent Langer took place in Germany/Grönwohld last week. 48 kids, 10 coaches, 28 test boards, 35 test sails, wind from 0 to 20 knots and plenty of bright faces. Windsurf lessons of all levels was the main focus, but additional activities such as Water Polo, Stand Up Paddling, Water Frisbee, Beach Soccer also were on the daily schedule. At tropical temperatures, the competitors were able to complete the big Kids Camp Race in good conditions at the end of the event.Daily awards ceremonies of the various challenges were celebrated every evening.